Pruned plants are not just more attractive – they are also more productive and healthy. If you want to get the job done properly, then a pruning saw might be just what you need. A good pruning saw can make your job easier. However, it can be somewhat challenging to find the right one. Here’s a review of the 5 best pruning saws around to help you choose. As a gardener, sometimes you’ll find that a hand pruner isn’t enough to do those tougher jobs. A pruning saw makes it easier for you to remove bigger branches from plants, and houseplants. It also allows you to trim the plants in a way that will not harm them. Breaking off a branch by hand might damage other parts of the plant. There are several top-quality pruning saws available for this very reason. But every task is different. It’s not only about finding any pruning saw. It’s about finding the right saw for you: one that, at the very least, meets your basic functionality requirements. The good thing about using a pruning saw is that it allows you to cut through thicker branches. Many saws can cut branches of 3 inches in diameter; and with a little more effort, you might be able to cut slightly thicker branches as well. One other benefit to note is that many pruning saws cut on both the push stroke and the pull stroke. This means that every time the saw moves, it creates a cut. This is far more efficient than many regular saws, as these tend to cut on only the push stroke, taking twice as long to get the job done. The quality of the saw blade is yet another reason for you to consider getting a pruning saw. The blades of these saws are usually made of tempered steel. This means they are very durable and the teeth are less likely to break during those tougher jobs. There are various types of pruning saws available. It is a good idea to familiarize yourself with the major types so that you can determine the best saw for you. These pruning saws allow you to get to higher branches. They consist of a long handle with a pruning saw attached to the end. In many cases, you might find that a pole pruning saw has a rotating head. This allows you to prune branches at odd angles. These saws are probably best for smaller plants grown at home. They tend to give you a bit more control than a pole pruning saw. This type of saw is generally best suited for thinner branches. These thinner branches allow for easy back and forth cutting motion. This one is usually better for cutting thicker branches that need to be cut in a single motion. The curvature of this saw helps it cut through thicker branches much more easily and cleanly. As with any other tool, be sure to take safety precautions when using a pruning saw to prevent injury. 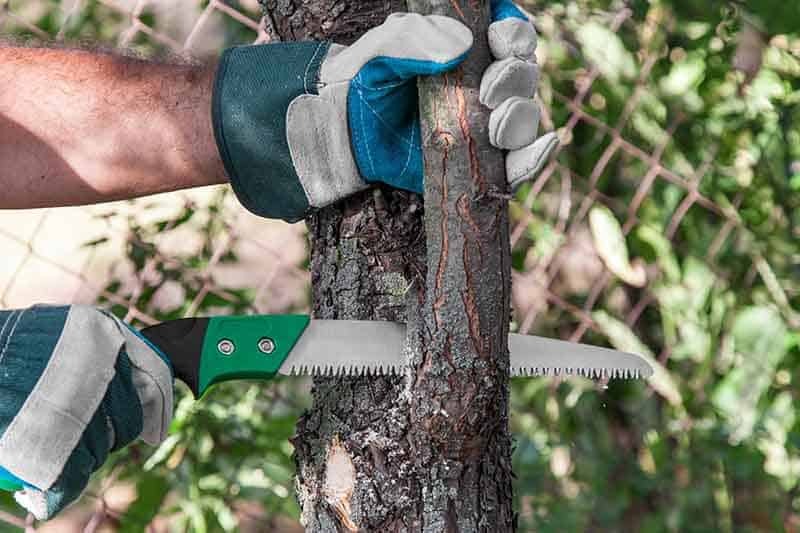 First, pruning saws have very sharp blades which can cause injury if care is not taken. Secondly, when conducting your pruning projects, it is essential to protect yourself from falling branches. Also, your pruning saws should be well cared for to prevent plants from getting injuries and diseases. When pruning high, thick branches overhead, it is best to wear a hard hat and safety glasses to protect your head and eyes from falling debris. It is also a good idea to wear long-sleeved clothing and gloves to protect your skin and hands from the saw and branches. One other recommendation is to use a holster on your belt to store the saw when you’re not using it. To properly care for your pruning saw, it is a good idea to clean it with rubbing alcohol after every use, making sure to use a strong cloth to clean between the teeth. It is also important to keep your saws sharp to prevent damage to plants. The Corona Razor Tooth, and the Samurai Ichiban all possess a curved blade, making them very useful for cutting through thicker branches with ease. The Corona Razor Tooth has folding capabilities, while the Ichiban comes with a sheath. The Fiskars 14-foot tree pruner is the only pole pruner on this list, and it is a decent choice for cutting higher branches. However, its cutting capacity is far less than the others, with its maximum diameter being an inch and a half. The Tabor Tools T6 and Eversaw folding hand saw both feature slip resistant handles and safety locks that are easy to open and close. Both these saws have decent cutting capacity. The Eversaw is a multipurpose saw used to cut wood, bone, and plastic. The Corona Razor Tooth pruning saw comes with blades of various sizes, including 7, 8, and 10 inches in length. It features an ergonomically designed co-molded handle for a comfortable grip. It comes with a curved blade and 3-sided razor teeth for efficiency. It also features a folding blade that is taper-ground, curved, and can easily be replaced. Its users love how easily it cuts through small and medium-sized wood, but do note the tendency of the center nut that secures the blade to come loose. The general consensus among users of the Razor Tooth Saw was that its curved blade and 3-sided razor teeth cut through wood very quickly. One Corona Razor Tooth user wrote that the saw was able to cut through 4 inch diameter trees in less than 30 seconds with little effort. Another user mentioned that the saw is very user friendly. They wrote that the Corona Razor Tooth saw was suitable for kids, parents, and grandparents alike. One user tested the saw along with a Bahco saw and found that the Razor Tooth worked much better. The user noted that the Corona Razor Tooth Saw took far less effort to cut through a piece of wood. This Fiskar’s Extendable Pruner is a pole pruning saw measuring in at 14 feet in length. It comes equipped with power lever technology and includes a 15-inch Wood Zig saw blade. Its maximum cutting capacity is an inch and a half and it comes with a lifetime warranty. Its users enjoy the overall long length of the pole and how easy it is to adjust it. They do note, however, that the cord on the pulley can get stuck if you are not careful. Another user said that the length of the pole on this pruner is very useful. The user tried using the saw to prune the top of an ornamental plum tree and had great success. Yet another user found the “hook and prune” operation to be very useful. According to the user, the blade cuts through wood like a hot knife through butter. The Samurai Ichiban saw is manufactured in Japan. It has a 13-inch, curved kyoku blade and comes with a scabbard. The saw weighs in at 11.2 ounces and has a tooth pattern of 6.35 teeth per inch. Many buyers agree that the saw is very easy to use and is very sharp. However, some users noted that the blade is much too thin for anything more than the lightest jobs. Many users are happy with the sharpness of the blade on this saw. One reviewer said that cutting through 4-inch limbs on a birch tree from a ladder was a breeze. Another user praised the handles, saying it is well designed and very comfortable. One reviewer claiming to be a small woman said she was able to tackle an apple tree with ease in under an hour. However, there were also quite a number of buyers saying the blade of this saw is much too thin for thick branches. The Ever Saw Folding Hand Saw is a multipurpose hand saw that you can use for cutting wood, bone, and PVC materials. It features a rugged 8-inch blade with triple-cut razor teeth and is designed with a slip-resistant handle and a gear style lock. A large number of buyers agree that the saw is sharp and produces a clean cut. However, it was also noted that the saw does not “lock” when it is in a closed position, which exposes the teeth and could be dangerous. The general consensus among users is that, while not the best, this saw gets the job done. One reviewer tried cutting through a piece of 6-inch wood, against the manufacturer’s recommendation. The reviewer said he was amazed at how flexible the saw was. It did not break as he expected. One other user said the saw was not just heavy; it was also not very sharp. This made the saw very difficult to use. The Tabor Tools T6 features an 8-inch straight blade. It cuts on the pull stroke and has a cutting capacity of wood up to 4 inches in diameter. The handle is designed with a non-slip material and it doubles up as a scabbard and sheath. This saw also comes with a safety lock. The general consensus among users of the Tabor tools T6 is that it is best suited for light, sporadic use. One user tested it against the Silky Pocket Boy and found that the Silky was much better suited for more frequent use and heavier jobs. Another user stated that the material used to make the handle is cheap and brittle, causing it to break after only 3 uses. The clear winner for this round up is the Samurai Ichiban. This saw is very lightweight, making it easy to carry around. It is hands down the sharpest pruning saw of the lot and produces a very clean, smooth cut. Compared to the others, this saw is the most powerful, allowing users to tackle the toughest of pruning projects with ease. If you're looking for a good-for-value pruning saw, I would recommend the Corona. Its quality is not as decent as the Ichiban, but it'll handle most of the pruning jobs you want for a long time.